Do you share your photos on Facebook or on Flickr? - Just Tell Me Why | Dichotomies, debates and opinions. Where do you share your photos? 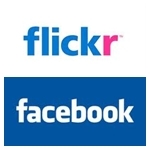 On Facebook or on Flickr?